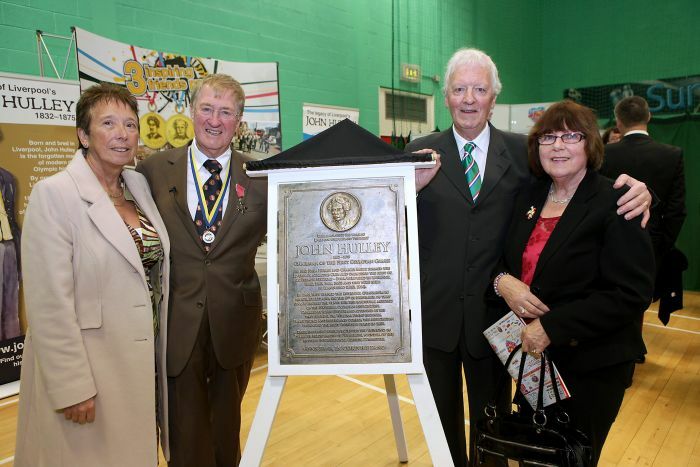 The plaque commemorating the life and work of the Liverpool Gymnasiarch John Hulley was unveiled on Friday 25 April 2014 by the Lord-Lieutenant of Merseyside and the Lord Mayor of Liverpool at the Lifestyles Park Road Sports Centre. Before an audience of invited guests, Tom Southern, Director of Operation Pathfinder and member of the John Hulley Olympic Festival committee, welcomed everyone to the ceremony and introduced Robin Baynes MBE founder of the Liverpool Heartbeat charity, and myself as keynote speakers at the ceremony. 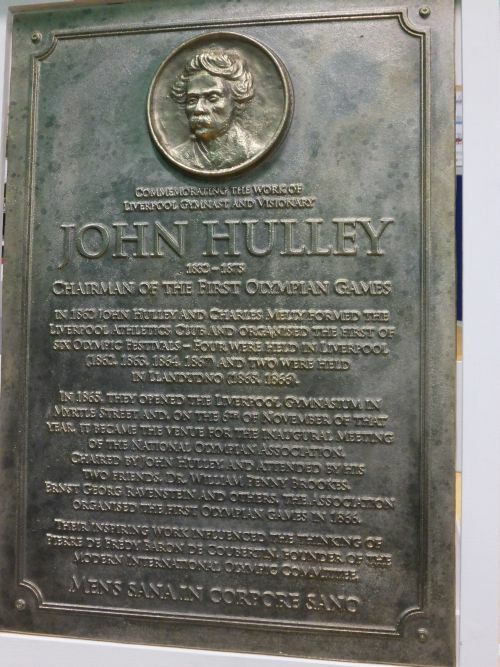 Robin gave an overview of the John Hulley Olympic Festival and the current work in hand to publicise forthcoming events, and I spoke of how I researched the life and death of John Hulley and the work necessary to renovate and rededicate his grave. A transcript of my speech is here. 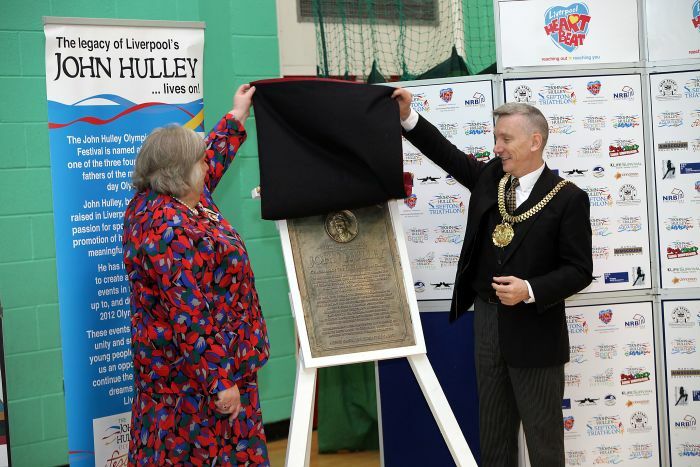 Tom Southern then invited the Lord-Lieutenant (Dame Lorna E F Muirhead DBE) to address the gathering before presenting the plaque on behalf of her Majesty the Queen to The Lord Mayor Councillor Gary Millar who accepted it on behalf of the city of Liverpool. 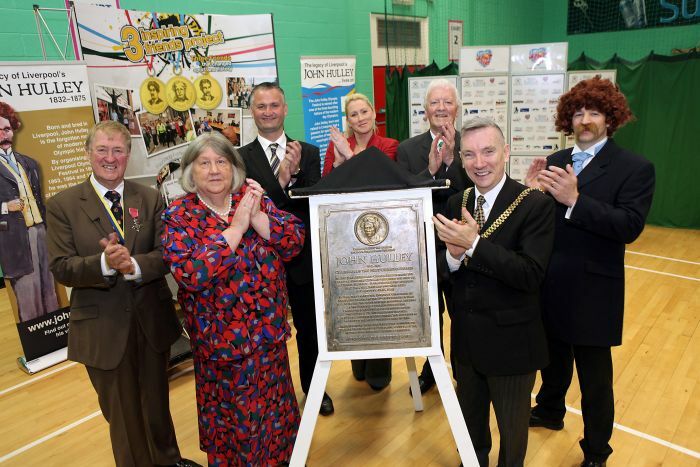 The plaque will be sited within the Sports Centre, wall-mounted alongside the trophy cabinet and other memorabilia. Let to right - ROBIN BAYNES MBE Founder of Liverpool Heartbeat charity and head of New Start, Liverpool; DAME LORNA MUIRHEAD DBE Lord-Lieutenant of Merseyside; TOM SOUTHERN Director of Life Survival, Operation: Pathfinder CIC and Foundation for the Prevention of Blindness; NICOLA BROADLEY Organiser of the John Hulley Family Fun Day at Aintree; RAY HULLEY DMS Family Historian, Vice-president and Southern representative of the Manchester & Lancashire FHS; COUNCILLOR GARY MILLAR Lord Mayor of Liverpool; LIAM HANLON Director at The Forshaw Group Liverpool, dressed as John Hulley. Robin Baynes was interviewed by Bay TV of Liverpool and a link to his interview is here. 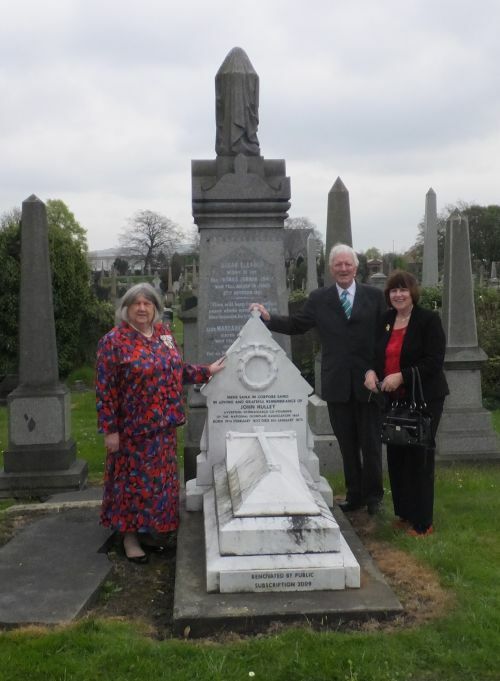 After the unveiling ceremony and closing remarks, Dame Lorna expressed an interest in visiting the renovated grave of John Hulley. She asked me, together with my wife Joan and sister-in-law Elisabeth, to accompany her in the official car the short distance to the nearby Smithdown Road cemetery.